Foreign Affairs Minister Joseph Malanji has revealed that President Edgar Lungu will be among regional Heads of State attending the BRICS Summit being held in Johannesburg, South Africa from 26th-27th July 2018. The BRICS is the acronym for an economic association of five major emerging national economies; Brazil, Russia, India, China and South Africa. The five BRICS countries represent over 3.1 billion people, or about 41% of the world population; four out of five members (excluding South Africa at #24) are in the top 10 of the world by population. They have a combined GDP (PPP) of around US$40.55 trillion (32% of World’s GDP PPP) and an estimated US$4.46 trillion in combined foreign reserves. Mr Malanji said President Lungu is travelling to this important meeting in response to an official invitation to attend the BRICS Africa Outreach Program by the in-coming Chairperson of BRICS and the Summit’s host President Cyril Ramaphosa of South Africa. On the sidelines of the Summit President Lungu will hold bilateral talks with Russian President Vladmir Putin, Turkish President Recep Tayyip Erdo?an among others. The BRICS Africa Outreach Summit with African leaders seeks to ensure continuity from the 5th BRICS Summit held in The summit was held in Durban, South Africa in 2013 and to provide BRICS’ support for African industrialization and infrastructure development. The sub-theme for the BRICS-AFRICA Outreach: BRICS in Africa: “Working towards the realization of the African Aspirations”. • Zambia – as incoming Chair of the SADC Organ on Defence, Politics. To do what you utterly lazy thing …you are not even a member!! Lazy Bum. Next week you’ll hear that Zambia wants to borrow $-Billions from BRICS-Bank. PF has no clue on how to develop the economy besides reckless, irresponsible borrowing. Lazy bum illiterate tribal insolent hooligan bully boy and son of a polygamist tribalist father hurling insults at the President and he has no clue that it is UNELECTABLE! Go Mr. President! Let’s develop this thing! It will never be president! Jay Jay you are a total twit!! How can you ask what the president is going to do at the BRICS summit?? You think he decided to gatecrash?? Do you even understand how governments operate?? What ideas can you even bring to such discussions?? The old saying goes, great minds discuss ideas, average minds events, small minds discuss people…. @1.1. with symptoms of Mad Cow Disease, kindly say hello to Prof. Hansoni. I guess the team of business people and cadres better get ready to accompany this great man of the soil called Lungu. 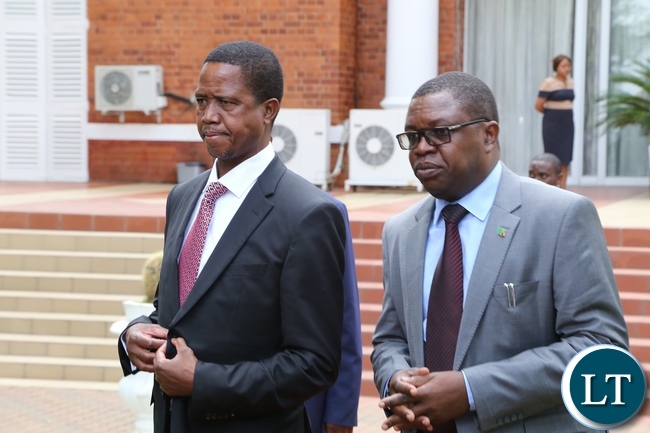 Zambia should insist that foreign visit costs are published each time Lungu travels. In a transparent society, these are published. It is in public interest. Zambians, learn to guard your future. Those of us that have travelled a lot know what we are talking about. There is everything right to ask our leader so to account for what our money is spent on. Zambian Citizen – But does your lazy President know how govts operate? How many MOUs did Lazy sign in 2018 where travelled? I remember him touring Eygpt for one week..have you seen anything yet? Zambia has been invited as an incoming Chair of the SADC Organ on Defence, Politics…there is absolutely no need for him to attend his foreign minister would have gone. He simply wants to go and shake hands with Putin and Jiping. Wake up ..dont make excuses for this lazy man!! Member of the Hatribes Association of Zambia – disgusting Childish behaviour. Just wondering, you two must be related or are you perhaps full beneficiaries of Plunderers Federation and “largesse” of the Endemically Corrupt Leader? Pass thru Swazi land to check on progress on our plot. Better still use this opportunity to squire another one in South Africa. Safe trip Mr. President when you return pass through Namwala, I am told dung has accumulated ever since I stopped cleaning Animo farm and it has affected HH and his tribal grouping. They are suffering from MAD COW DISEASE as evidenced by irritability, H-anger issues, Hallucinations, delusions, hatred and Childish behaviours. Why bother inviting this inept guy to the summit? He will takeaway nothing from this meeting.He will be there to take up space and probably solicit for more loans. “They should have invited HH,” Larry Mweetwa. Kwena bakweba! MAD COW DISEASE! Do you expect anything else from a toilet cleaner ? By now we know the drill, seeing the President off and well coming him back with a military top brass. Others are going as Chair of regional organizations. Why is Zambia going as Chair of a Committee of a regional body. We surely have no pride. No vision either. Initially it was BRIC and South Africa was not part of it. South Africa belonged to VISTA which is the acronym for Vietnam, Indonesia, South Africa, Turkey and Argentina. BRIC is observed as top emerging economies while VISTA is developing quickly. Economic pundits have made their minds to add South Africa to BRIC and it is now BRICS (Coyle etal. 2016,p.6). This thing named jj, is it a cockroach or a lice? Only one of the two, please tell me my brethren, I want to select a suitable insecticide. This th.ing named jj, is it a coc.kroach or a li.ce? Only one of the two, please tell me my brethren, I want to select a suitable insect.icide. It is a LICE! On HH’s ….! As China #6 eloquently put it……lungu is probably the most travelled leader in our region yet to date Zambia has some of the highest unemployment and debt figures…. My only issue here is infatuated LT is with Lungu… every day there’s a headline, Lungu this, Lungu that… sometimes several headlines of him in a day. It’s almost like the earth’ axis revolves around him. It’s pathetic! This is the reason why the country can’t progress. You treat this guy like he’s a demigod that needs to be worshipped on a daily basis. When you at what value his headlines add to the country, it’s almost zero. I have said this before, please learn to bring proper stories about ordinary people who make a positive difference in society, unworshipped everyday heroes who do acts of kindness. …Ordinary people like the rescuers of the trapped Thai Cave soccer boys make up the headlines. And that’s the was it should be as such stories actually inspire people. Zambia and South Africa don’t belong here in this BRIC grouping as both are not top growth economies. He is going to Bricks summit as an observer just to see how things are done in developed countries not in Katemba countries he is just a misfit there. I wish a T were there to represent Zambia,” Larry Mweetwa. Thanks so much to all those who have suggested my name to go for BRICS MEETING THAN THE PF STRONG MAN. Thanks for the trust you have in me. You missed it retarded! You were quoted as saying “I wish a Toonngaa” was there to represent Zambia not that Larry Mweetwa the tribalist, was proposed! Dull! Where you in the background? Under what name were you hiding in?